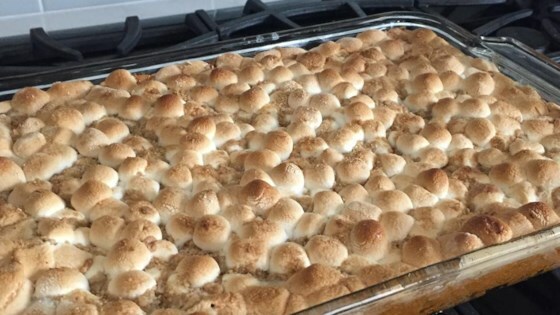 "The brown sugar, cream, marshmallows, and oatmeal streusel give this casserole a taste similar to sweet potato pie, yet the dish goes great alongside meals as varied as low-key chicken dinners or festive holiday banquets. And the great part is, if you're planning to use this for entertaining, you can make everything but the streusel a day ahead so you won't be stressed at crunch time." Rub the skin of each sweet potato with vegetable oil; place potatoes on a baking sheet. Bake in the preheated oven until tender, about 1 hour; remove and cool slightly. Reduce oven temperature to 350 degrees F (175 degrees C). When sweet potatoes are cool enough to handle, scrape flesh into a large bowl; discard skins. Beat sweet potatoes with an electric mixer until smooth. Measure 6 cups of mashed sweet potato into a large bowl; beat in 3/4 cup brown sugar, cream, 1/4 cup melted butter, 1/4 teaspoon cinnamon, and salt. Pour sweet potato mixture into an 8x8-inch baking dish. Place the rolled oats into the bowl of a food processor or blender, and pulse until oats are finely ground. Place oats, 2 tablespoons brown sugar, flour, and 1/8 teaspoon cinnamon into a bowl. Cut 2 tablespoons cold butter into the oat mixture with a pastry blender or fork until crumbly; sprinkle evenly over sweet potato mixture. Bake in the preheated oven until sweet potatoes are heated through and oatmeal streusel is lightly browned, 70 to 80 minutes. Remove from oven, sprinkle immediately with marshmallows, and let stand until marshmallows are melted, about 10 minutes. See how to make a classic Thanksgiving sweet potato casserole. Sweet potatoes vary widely in size. To yield 6 cups mashed sweet potatoes, you will need about 2 1/2 pounds of raw sweet potatoes, or about 5 to 6 medium sweet potatoes. This was so good! It doesn't seem to make a lot of strudel, but if there was any more for my 11x13 pan of sweet potato, I think it would have been too much. These were a big hit! I'm so excited to finally try this dish myself. I've had it made for me for many years and was yearning for it lately. Thanks for the recipe!